Sagan and Valentino study shows Americans would likely support nuclear first strike. Americans are disturbingly unbothered by the idea of striking first with nuclear weapons. 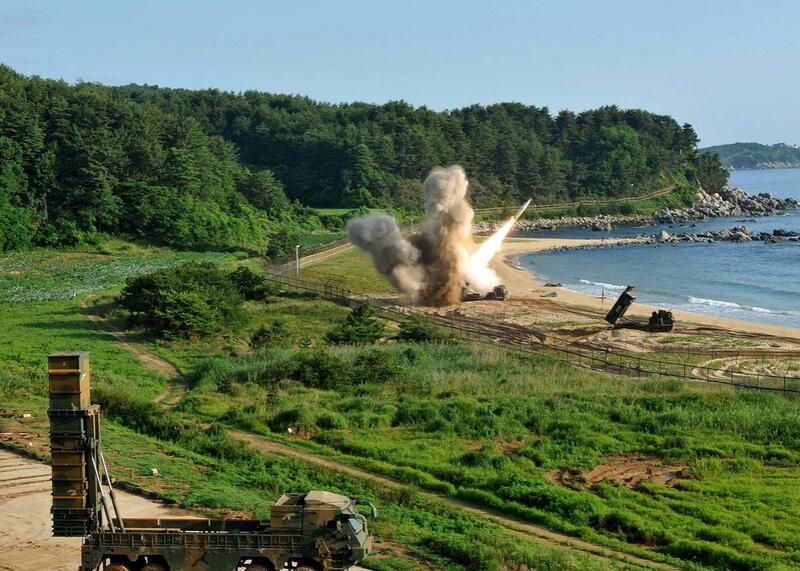 A U.S. M270 multiple-launch rocket system fires an MGM-140 Army tactical missile during a U.S.–South Korea joint drill on July 5 in South Korea. As President Trump rails against North Korea, threatening to rain down “fire and fury like the world has never seen” if it so much as tests another long-range missile, the world can’t help but wonder: Would he really do this? Would he order a nuclear strike, the ultimate fire and fury, against a country that hadn’t attacked us first? Many are doubtful. His top security advisers would oppose such a move. So would the American people who, though they have no formal say in the matter, would impose constraints on a president’s actions—or so goes the conventional wisdom. Some scholars have written of a “nuclear taboo” ingrained in our sensibilities since the bombing of Hiroshima. Others detect a growing revulsion against the killing of noncombatants even with conventional weapons. However, a new study suggests that these comforting notions are mistaken. In the latest issue of the journal International Security, Scott Sagan and Benjamin Valentino, respectively professors at Stanford University and Dartmouth College, conclude that the American public is “unlikely to serve as a serious constraint on any president who might consider using nuclear weapons in the crucible of war.” In fact, under pressures similar to those facing President Harry Truman at the end of World War II, a clear majority of the public would support the first use of nuclear weapons now, just as it did back then. Some opinion polls appear at first glance to show otherwise. A majority of Americans now say that Truman was wrong to drop atomic bombs on Hiroshima and Nagasaki. But Sagan and Valentino regard those polls as “a misleading guide” to understanding Americans’ “real views” on the use of nuclear weapons and the killing of civilians. The problem with the Hiroshima polls is that Americans today lack the mindset of Americans in the time of World War II. Japan is now a leading U.S. ally. Few among the living remember the shock of Pearl Harbor or the horrors of the war in the Pacific and the desperate desire to stop the slaughter of American troops by any means necessary. So, the two professors—Sagan an eminent scholar of nuclear strategy, Valentino an expert on public opinion and the use of force—came up with a clever way of gauging how Americans would react in a similar situation today. They commissioned the polling firm YouGov to conduct a survey in which those polled were shown a mock news story. In this story, the United States imposes sanctions on Iran for violating the Iran nuclear deal. Iran then attacks an American aircraft carrier in the Persian Gulf, killing 2,403 U.S. military personnel (the same number as those killed at Pearl Harbor, though this parallel isn’t drawn explicitly). The U.S. responds with airstrikes on Iranian military facilities. Iran refuses to surrender. The U.S. invades Iran but gets bogged down after 10,000 American troops are killed. Those polled were then given a choice. Should we persist with the ground invasion all the way to Tehran, knowing that 20,000 American soldiers would be killed? Or should we drop a nuclear bomb on Mashhad, Iran’s second-largest city, “to pressure the Iranian government to surrender”—an attack that would kill 100,000 Iranian civilians (an arbitrarily chosen number). The results were unsettling, though not so surprising. More than half of the respondents, 55 percent, favored dropping a nuclear bomb rather than proceeding with the invasion. An even higher number, 59 percent, said they would approve the president’s action after the fact if he chose to drop the bomb. Then the pollster changed one key premise: What if the nuking of Mashhad killed 2 million Iranian citizens—which would you prefer: dropping the nuclear bomb or proceeding with the ground invasion, which would kill 20,000 U.S. soldiers? Those favoring the nuclear option did drop, but not by much—from 55 percent (under the scenario with 100,000 killed) to 47 percent (under the scenario with 2 million killed). More sobering, the same number as before—59 percent—said they would approve the president’s action, after the fact, if he decided to drop the bomb. In other words, to 47 percent—nearly half—of those polled, killing 2 million Iranian civilians is preferable to killing 20,000 American military personnel, a ratio of 100:1. It should be noted the survey was taken in July 2015, when President Obama was still in office. Neither the pollster nor the mock news story mentioned any president by name. Still, one wonders whether the numbers would be different—and if so, whether they’d be higher or lower—if the poll were taken during Trump’s presidency. Different factions of the American public have different opinions, as one might expect. The 55 percent who preferred the nuclear option can be broken down in various ways: 68 percent of Republicans felt that way compared with 48 percent of Democrats; 71 percent of people over the age of 60 versus 52 percent of those under 60. But there were only scant, or no, differences between men and women, whites and nonwhites, college-educated and non-college-educated. The biggest difference was between those who favor the death penalty (57 percent were for the nuclear option) and those who oppose it (just 32 percent). Still, except for that last category, a pretty large percentage of people—in almost every case, a majority—preferred using nuclear weapons against a country that hadn’t used nuclear weapons against us. These results don’t necessarily apply to North Korea, which Trump has threatened to nuke even before they deploy an intercontinental ballistic missile, much less fire one our way. And public opinion on Trump’s use of nuclear weapons, or any other kind of weapon, would likely be colored by opinion on other aspects of his presidency. But before heaving a sigh of relief, we must follow Sagan and Valentino down one final, very dark path. There was one more section in the poll, which threw another option into the mix: a diplomatic option. In this option, if Iran surrenders, its supreme leader, Ayatollah Ali Khamenei, would be allowed to stay as a spiritual figurehead with no political power. So now, the pollster asked, which would you prefer: the nuclear strike (killing 100,000 Iranian civilians), the ground invasion (killing 20,000 U.S. troops), or the diplomatic option (ending the war with no further deaths)? Given this choice, 40 percent of those polled still said they preferred dropping the nuclear bomb. Only slightly more—41 percent—favored the diplomatic option. (19 percent stuck with the ground invasion.) Sagan and Valentino describe this result as “particularly disturbing.” The drop-off of those favoring the nuclear option, from 55 percent to 40 percent, is considerable. But 40 percent preferred dropping a nuclear bomb to settling the war without shedding another drop of blood. Few Americans today express such views about Japan, but it would be falsely reassuring to believe that such sentiments are anachronistic, produced by the long and deadly fighting in the Pacific War. Our experiments reveal a darker truth. As in 1945, a significant portion of the U.S. public today would want to use nuclear weapons against an enemy that attacked the United States even when presented with a diplomatic option to end the war. For this significant portion of the U.S. public, there is no atomic aversion. Atomic attraction prevails.